Chances are you’ve heard a thing or two about bullet journals lately. The Bullet Journal trend is quickly becoming the hottest new way to take notes, doodle and collect your thoughts. This “analog system for the digital age” brings note-taking back to the basics: pen and paper. The bullet journal trend replaces piles of sticky notes and endless digital notepad apps. Using a Bullet Journal-brand notebook, or a similar technique in an ordinary notebook or pad of paper, can be an efficient way to keep track of your everyday tasks, routines, wish lists, thoughts and more. Best of all, it curates all your thoughts into a sleek, tangible body of paper — bringing back the notion that when pen meets paper, beautiful things can happen. 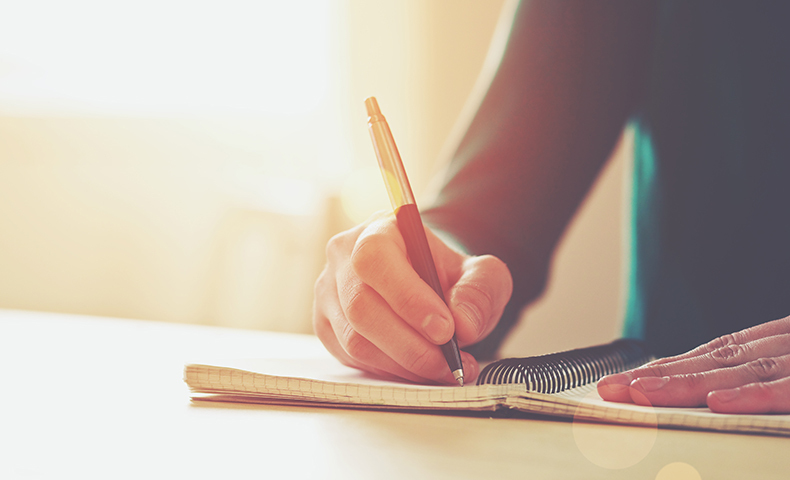 Research has shown that taking notes by hand helps students learn more and offers other cognitive benefits. So it stands to reason that bullet journaling can be beneficial to students, professionals and anyone else who recalls information better when they write it out by hand. Because it works, the bullet journal trend has grown so much in popularity that it has nearly 200,000 #bulletjournal spreads on Instagram and hundreds of customized templates and tutorials on Pinterest. Getting started is easy. All you need is a notebook and a pen. The concept is to organize your thoughts in a way that you understand. You can use different signifiers to indicate different tasks, or you can designate different ink colors to remind you of certain things. You can also build a bullet journal with just a few simple components. Identify and number the pages. All pages should be numbered in the lower-left corner to make items easier to find. Then write a title for each page. The easiest thing to do is start with the first day of the month, and move on from there. One bullet journal cycle lasts two months. Note: Don’t start on the first page of the journal. Leave a few pages blank (more on that later). When you create a list on the page, don’t write it as a to-do list. That’s where the concept of rapid logging comes in. With a bullet journal, every item will fall into Tasks, Events or Notes. For example, if you were writing a list for what you needed to do tomorrow, you would write short descriptions for each item. Then, label each task with an icon so you can differentiate between tasks (finish presentation), events (birthday dinner) and notes (delivery arrives tomorrow). Because tasks are actionable items, Bullet Journal founder Carroll wants to make sure users can differentiate between complete and incomplete tasks. This is where it gets a little tricky: In a bullet journal, tasks are complete, migrated or scheduled. If it’s complete, you can cross it off your list. If it’s been scheduled, you will have to complete it on the planned day. At the end of the month, any incomplete tasks are migrated to the following month, with the idea that you’ll complete them then. That’s why it takes two months to complete a bullet journal cycle. Remember the blank pages at the beginning of the journal? Those become your index. As you number your bullet journal and fill things out, you may find that you have 31 pages for the month of August, then three pages of doodles, two pages of birthday plans, and then 30 more pages for September. The index acts like a table of contents. Just write topic names and their corresponding page numbers as you create them. Now you can easily find that information instead of thumbing through the entire journal. This video explains the bullet journal trend a little further. Remember, how you use a bullet journal is completely up to you. Be as creative or as uncreative as you want. The point of the bullet journal trend is to organize your thoughts, lists and life. Give the bullet journal trend a try, and visit us on Facebook or Twitter to let us know how it’s going.